The justice minister of Ireland did not find a conclusive link between cash for gold shops and increased precious metal burglary in the country, but the minister's study did recommend that the country look at some controls for the industry. Report on the Cash for Gold trade was authored by Alan Shatter, Ireland's Minister for Justice, Equality & Defence and released early in June. "There is no apparent 'major crime' involvement in the issue. Burglaries in 2011 are up 7.9% on 2010 following a reduction of about 5% on 2009; over the period 2005 to 2011 burglaries have increased from 26,381 in 2005 to 27,439 in 2011 – an increase of 4%," writes the report authors. "It can not categorically be stated that there is no connection between criminal activity and the cash for gold trade but up to very recently there has been little or no evidence to suggest that this is the case." One report of criminality was found, where an individual tried to sell two rings for €90 at a cash for gold shop while under the influence of heroin. The rings were worth €650. The report didn't mention if the sale was successful. The report did recommend that there are grounds for considering controls on cash for gold outlets. 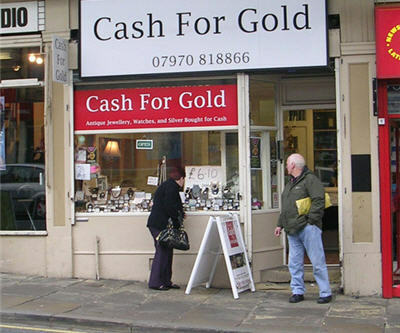 "The existing law in relation to Pawnbrokers and perhaps other existing statutory frameworks would provide a useful template for some of the regulatory matters being considered," writes the report's authors. Lawmakers have been pushing for action. “I have received many concerned queries from constituents about this trade," wrote Derek Nolan, Labour T.D. for Galway West. "The ever increasing 'Cash for Gold' trade is causing concerns in local communities right across the country. The fact is that with the price of gold at historic highs, jewellery has become an easy target for burglars.There must be a targeted, proportionate and balanced response to any potential crime that is linked with this trade," writes Nolan. To write the report, the ministry visited 124 cash for gold operations in Ireland.